We call on the United Nations to establish an Animal Rights Bill in respect of our fellow creatures to a right to peace on earth in keeping with the establishment of Human Rights in the last century. We can no longer accept the suffering, torment, abuse, torture and murder of those who cannot speak, nor can we allow the human race to continue to dictate over Animal Rights of freedom to further their own needs and gain. Just like humans, animals seek to protect their life and live peacefully on earth. Who are we to deny them this? The establishment of Human Rights marked a new era in rights and justice, though human conscience does not permit us to forget or exclude those who in reality have the capacity to feel, this compels us to believe that moral limits must apply to non human as to human. Just as all races are included in human rights all species should be included in Animal Rights. An Animal Rights bill will not only end animal suffering and save countless animals, it may have a far greater effect than we can imagine. It may benefit civilization in its struggle towards peace on earth. We have come to understand the way humans treat animals reflects on how they treat one another. Those who choose to inflict violence on animals are usually violent towards humans. 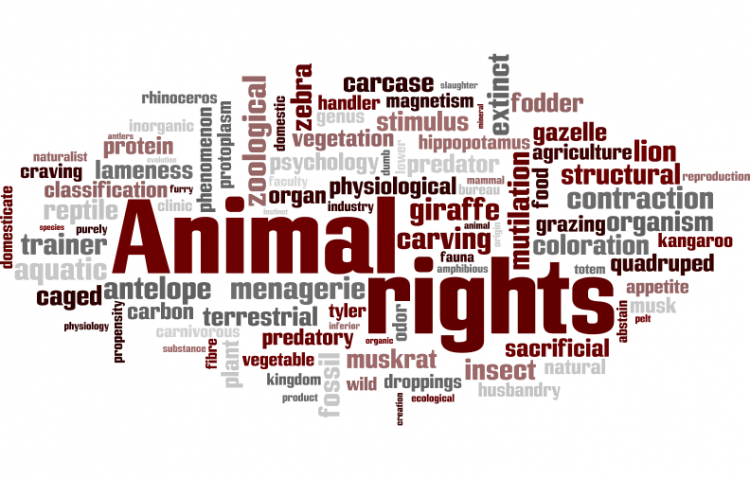 The establishment of Animal Rights is a logical and natural progression in human thinking that may bring civilization closer towards a more peaceful world not only for humans but all living beings. A UN Animal Rights bill is crucial in ending the inhumane actions of the countries listed. 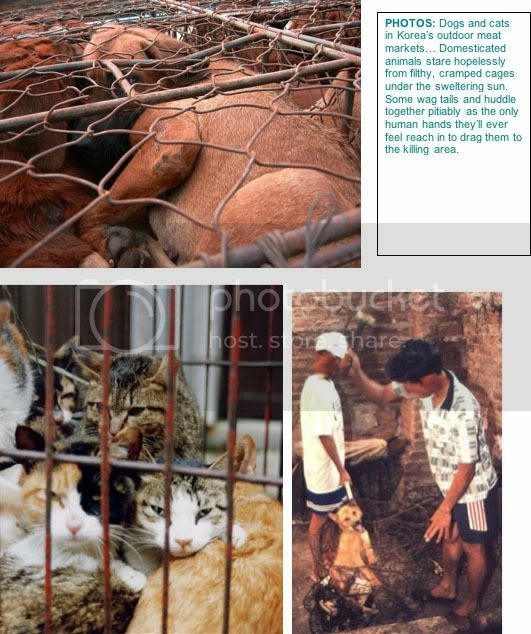 The demonic dog and cat, meat and fur trade in China, Korea and Vietnam endure cats and dogs to a life of despair, misery and suffering before slaughtering them with acts of torture for their own selfish needs; food and the profit from fur. This monstrous brutality is being committed in the name of so-called tradition. The USA's sickening culture of dogfighting is the result of a violent society that has led criminals to force dogs to fight to the death for the amusement of humans and profit. Afghanistan is another violent culture that uses the suffering and death of dogs for a cultures' entertainment. The bear trade in China, Korea, Japan and Vietnam force bears in captivity for years - holding them in tiny cramped cages, enduring them to a life of suffering and despair for the extraction and profit of bile used for Chinese medicine, when a bear can no longer produce bile they are killed for their meat, fur, paws, and gall bladder. The monkey trade in Cambodia, Malaysia, Mauritius and Nepal cruelly capture and export monkeys for profit to research labs in the United States, China, United Kingdom, Russia and Iran. Moral-less humans sacrifice the lives of monkeys for science experiments, medical research, food, fur and profit. Japan's senseless dolphin and whale slaughter is commited in the name of science and the needs of a greedy culture. The ivory trade in Namibia, Kenya, Zimbabwe, South Africa, Zambia, Sudan, Republic of Congo and Botswana has lead poachers heartlessly to kill elephants for profit. Elephants endure suffering and indignity as they are killed in order for humans to obtain ivory from elephants tusks used for jewelery, piano keys and souvenirs. Bear and deer hunting in parts of the USA and Canada is committed by ignorant humans for food, sport, leisure and a sense of achievement. The American tradition of rodeos is where animals are abused, berated and humiliated by humans for entertainment and profit. The dancing bears in India, Russia, Bulgaria, Romania and Ukraine spend a life time at the end of a rope, they endure suffering, torment and abuse for human entertainment and profit. In the middle east and throughout the world horses, donkeys and mules are used to carry heavy loads. In harsh environments these unfortunate animals are forced to carry and pull humans, rocks, furniture, fruit etc. loads that are far to heavy for tiny donkeys. They are beaten and abused; those that are injured and no longer useful are abandoned by the side of the road. The Spanish culture of bullfighting is a sport where bulls are tormented by cowards before stabbing them to death with spears in an act of so-called heroism for the amusement of humans. Canada's yearly seal slaughter, where thousands of innocent baby seals are clubbed to death and often skinned while still alive is barbarianism at its zenith. All this just for a few more dollars for the government ... one that prides itself on a no-kill judicial system for its humans and one that will not even permit a non-Canadian criminal extradition if capital punishment is a possibility in his returning country. The US Defense Department test weaponry on animals. Animals are subject to irradiation, burning, bombings, wounds and decompression sickness. Every year, at least 320,000 primates, dogs, pigs, goats, sheep, rabbits, cats, and other animals are hurt and killed by the DoD. Turkey, Greece, Serbia, Puerto Rico and Romania's inability to provide and protect the welfare of their animals has led to neglect, suffering, abuse and killing of their animals due to the effects of immoral and uneducated cultures. There are many more injustices facing the souls of the Animal Kingdom, these are only a few examples. In reality the human race's violent and greedy nature will not only lead to the extinction of animals but its own demise. It is time the United Nations honour what it claims to stand for: freedom, peace and a just world for all. I sign this petition in support of a United Nations Animal Rights Bill in recognition of the souls of the Animal Kingdom to a right to peace, freedom and justice on earth! The Animal Rights Bill petition to UN was written by Alexandria Naumovska and is in the category Animal Rights at GoPetition.